Miscellaneous Rentals is a one-of-a-kind rental company located in Austin, TX. Our huge selection and creative staff are here to help you realize your vision. From event lighting to makeup stations to beverage troughs to pipe and drape services, we have everything you could possibly need (and more) to support, expand, and enhance your production or event. If you need something that we don’t have in stock, we know all the right people in town to locate it on your behalf. We will go out of our way to make our customers happy! Fun fact: We are the only place in Austin where you can rent industry-standard directors chairs! What are people saying? View us on Yelp! 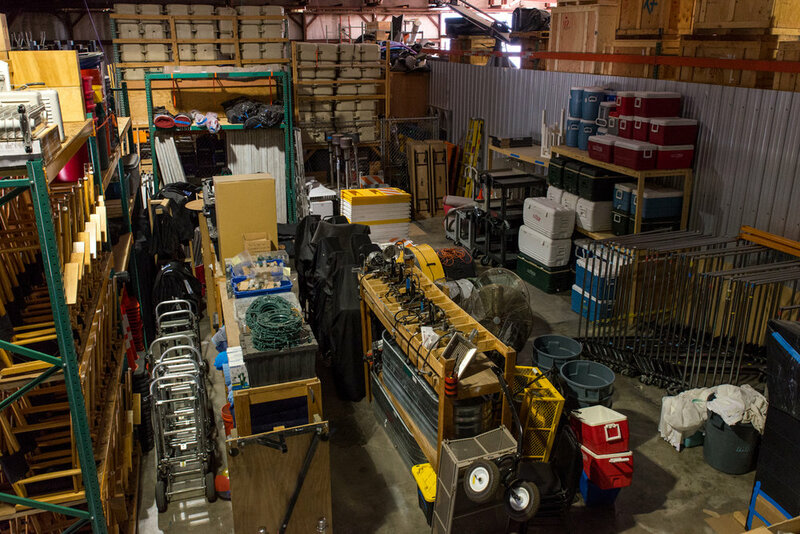 "Best production supply/ party/wedding/ event/ all-kind-of-useful-stuff rental company in town, hands down. They could not be more accommodating and their staff is super helpful and friendly. Very flexible to individual customer's needs and time-tables too. I've been doing business with them for 10 years and have rented everything from tables, chairs and linens for parties, tents, coolers, work lights, and trash cans for movie sets, to portable air-conditioners for my rent-house tenant when her A/C went out on a Sunday." - Katie T.
"This place rocks. Beth and staff are always accommodating and helpful. They go out of their way to make sure you get what you need. If you are filming, having a party, getting married, or sponsoring an event- you should check um out. Great LOCAL company to do business with!" - Monique C.
"I live all the way down south and I come all the way up here for the customer service!" -Dora T.
"Beth and Pam and the rest of the staff at Miscellaneous are the best in the business! I always enjoy doing business with them. You're in great hands with Misc Rentals!" - Charles M.
Need to rent a party bus in Austin? Check out our friend Austin Party Bus Service. They have Premier party buses at affordable rates! Proud member of LocallyAustin.org and Shop Zero Waste, a new city-wide initiative helping Austin reach its Zero Waste goal. Why buy a product you'll only use once? Renting from us is simple and affordable- and helps keep trash out of the landfill.